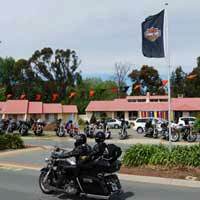 On 21 October 2012 Harley-Davidson Australia hosted a Show N' Shine display at Gold Creek Village. 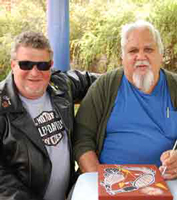 To mark the event, local Indigenous artist Michael Huddleston was engaged to paint a design for a special Harley-Davidson leather jacket which is currently touring the world and will later enter the collection of the Harley-Davidson Museum in Milwaukee, Wisconsin, USA as a part of Harley-Davidson’s 110th Anniversary Celebration. Artist Michael Huddleston is pictured above with Nigel Villiers from Harley-Davidson UK wearing the Harley-Davidson jacket which will later go on display at the Harley-Davidson Museum in Milwaukee. Michael's circular artwork for the jacket depicts a kangaroo and emu in rarrk (cross hatched design). Kangaroos and emus are important food sources for Aboriginal people, they are also motifs depicted on the Australian coat of arms. Gold Creek Village roared with nearly 2,000 Harley-Davidson motor bikes converging for the event with riders from all regions of Australia as well as riders from the USA, Japan, Singapore and the UK.